Pictured here is the Colburn's autocross car. The father/son team started out with a late model 500 coupe. They stripped the car to lessen the weight and installed a 180hp turbo engine. After several years of racing the turbo, they built a twin belt driven supercharged engine with JUDSON blowers. Their success was fair with either of the two air cooled engines but when they swapped to the CROWN V8 the car really woke up. They started with a 383ci SBC and let the car evolve to what it is today. It is a 383ci w/B&M supercharger. The car is still using the CROWN adapter and trans parts and a modified suspension that the father/son team experimented with and constantly changed through the years. REAR ENGINE SPECIALISTS, INC. built the transmission and various differentials with different ring and pinion ratios and positraction values. REAR ENGINE SPECIALISTS, INC. also built the rear hub bearing assemblies. Rear Engine Specialists, Inc. has been fortunate to build transaxles for a number of V8 Corvairs locally and around the country. 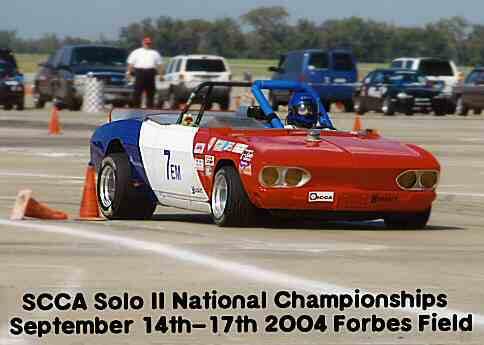 The Colburns have won 3 Don Yenko awards at national CORSA conventions as well as many trophies at SCCA races in the Denver area.